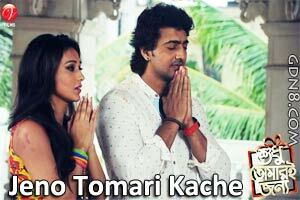 Jeno Tomari Kache Lyrics From Shudhu Tomari Jonyo Bengali Movie. Starring By Dev, Mimi Chakraborty , Srabanti Chatterjee And Soham Chakraborty. Sung By Ash King &m Somlata Acharyya Chowdhury. Music composed by Arindom Chatterjee And bangla Song Lyrics written by Prasen.